When you reach the end of the day and realise you haven’t achieved the things you wanted to. You’ve got a hectic day tomorrow, which means you’ll be too stressed to get them done, and now you feel full of self-doubt and anxiety. Wouldn’t it be great to wake up the next day feeling fresh, positive and confident instead? When you’re rushing around and unprepared in the morning, it makes you vulnerable to engaging with negative thinking. However, if you develop your own Confidence Boosting Morning Routine, even for just a few minutes, you can feel confident and alert. Eat breakfast mindfully. When I eat breakfast I tend to be distracted by the family or by multitasking. Take the time to sit down properly and notice the smell, taste and texture of your food as you eat it. This keeps you present and has also been shown to reduce the amount you eat. Do you have any other ideas on how to start the day confidently? Let me know so I can try them out in my routine. 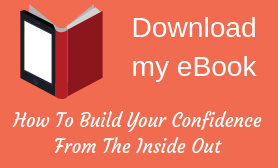 To sign up for even more awesome confidence blogs, just click here.